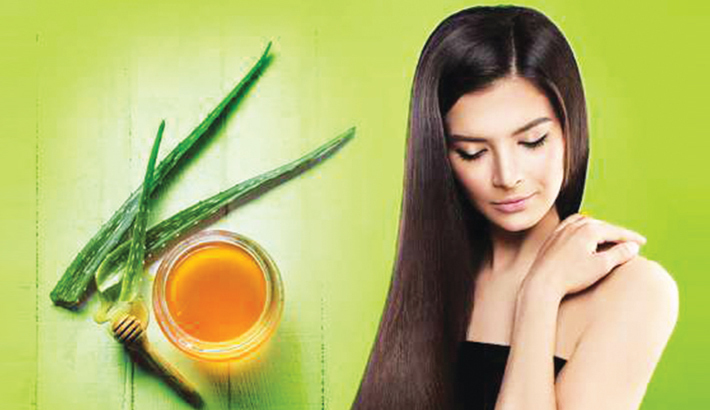 Women in Bangladesh, India and other countries have always boasted the virtues of aloe vera. Aloe vera seems to be a magic ingredient that helps in almost everything. It is used to obtain beautiful skin and helps reduce weight. It is also the cure to many diseases and gives lustrous, shiny hair. Aloe vera is known for its properties of hair growth which makes it an ideal component in many modern day’s shampoos and hair creams. You can make your own aloe vera recipe at home to derive the benefits of this magic plant. However, you need to keep in mind that nothing happens overnight. Give it some time and you are sure to see great results within a few weeks. Aloe vera contains proteolytic enzymes, which help heal and repair the damaged cells in your scalp. This improves the health of the hair follicles and indirectly boosts healthy and faster hair growth. Not only does the proteolytic enzyme help heal the scalp, but it also helps stimulate dormant hair follicles, promoting hair re-growth. It also helps curb hair fall and controls hair shedding, ensuring that your hair remains thick and voluminous. Besides that, it has anti-inflammatory properties that help soothe your scalp of irritation and aggravation. Aloe vera’s high content of protein, vitamins, and minerals help it nourish your follicles and hair efficiently. The moisture content of aloe vera helps condition your hair, locking in nutrients and hydration. It’s an all-in-one ingredient that you hair craves for. Take about 3-4 large onions and blend them to a puree in a blender. Use a cheese-cloth to extract the juice. To the juice, add the aloe vera gel and mix well. Massage this mixture into your scalp and work it through your hair until your hair is saturated with the liquid. Leave it on for about an hour and then proceed to rinse your hair. Wash your hair with a mild shampoo and finish with conditioner. Do this once a week. This is one of the more intense hair growth treatments. It helps curb hair fall and promote hair re-growth. Onion juice is an excellent hair growth ingredient that stimulates your scalp and the dormant follicles on it. Regular use of this mask will give you amazing length and thickness. Just be careful! Onion juice is potent, and can potentially irritate your skin. In a bowl, mix castor oil and aloe vera until you get a smooth and consistent paste. Apply this mixture to your scalp and hair. Ensure that you’re focusing most on your roots and tips. Once your hair is fully covered in the mixture, cover it with a shower cap. Go to bed with the mixture on your head. You may wrap a towel around the shower cap for added heat and to keep the shower cap from shifting. In the morning, wash the mixture off with cool water and shampoo. Finish with conditioner. In a bowl, combine honey, coconut oil and aloe vera until you get a smooth mixture. Start by massaging this mixture into your scalp and then work it down to the tips of your hair. Focus on the tips as these are the most damaged parts of your hair. Once all of your hair is covered in the mixture, throw a shower cap on and wait for about 25 minutes. Wash your hair with cool water and shampoo. Finish with conditioner. Too much of anything is not good. Make sure you do not overdo these treatments. Once a week is enough. Also remove the hair masks properly using a good shampoo. Make sure you use a conditioner after cleaning your hair.